I've had the pleasure of presenting multiple events in the last year, in England, Scotland and the Republic of Ireland, discussing ways of applying social business in the public sector (as well as meeting with many organisations working in the sector) and energy and expertise of the enthusiasts in this space continues to amaze me. While I understand their frustration at how hard it is to move a social business agenda forward in the organisations they work in, there is a growing appetite (indeed, demand) at the top of governemnt to drive the use of digital to deliver better citizen outcomes. For these events, I reworked my digital engagement chart for the public sector, and as I listened to the other speakers it became clear that the message I use with commercial companies is even more true in the public sector. Successful external engagement requires a culture of social collaboration internally and the true value of external engagement comes when you can connect all your staff, across the organisation, to the insights you are gaining. This week's Scottish Public Sector event organised by Mackay Hannah really highlighted these messages. Whilst its agenda ostensibly focussed on social media and the web site, the theme to emerge most strongly was collaboration across organisations and departments. In the opening keynote, John Swinney, Scottish Cabinet Secretary for Finance, Employment and Sustainable Growth, clearly set out the need and the promise of the digital age. To move from government programs that are what they are, and either match a citizen's needs or don't, to delivering the personalised services that each individual citizen requires. This goal, he pointed out, can only be achieved by joining up many public sector and voluntary sector organisations, sharing knowledge, linking processes, spreading best practices and creating a culture of collaboration. When discussion got on the how to deliver those digital services, it was the mobile device not the web site that dominated the discussions. It might be true, as Colin Cook, Head of Digital Strategy and Programmes for the Scottish Government said, that “the critical word is SOCIAL not MEDIA” but you'd better deliver the media where people want it. There's little point in tweeting a link to your web page if it isn't readable on a smartphone. So should you have a mobile web or mobile app? The answer is both, but each for its own purposes. Web sites must become responsive and mobile apps need to be rethought in terms of their relationship to the user, not the capabilities they deliver. It's written before about the way multiple technologies combine to provide disruptive change, and this is often the reason adoption seems to happen suddenly and quickly when technologies have been around for a while (digital is hardly new, so why is gigital government suddenly happening now?). 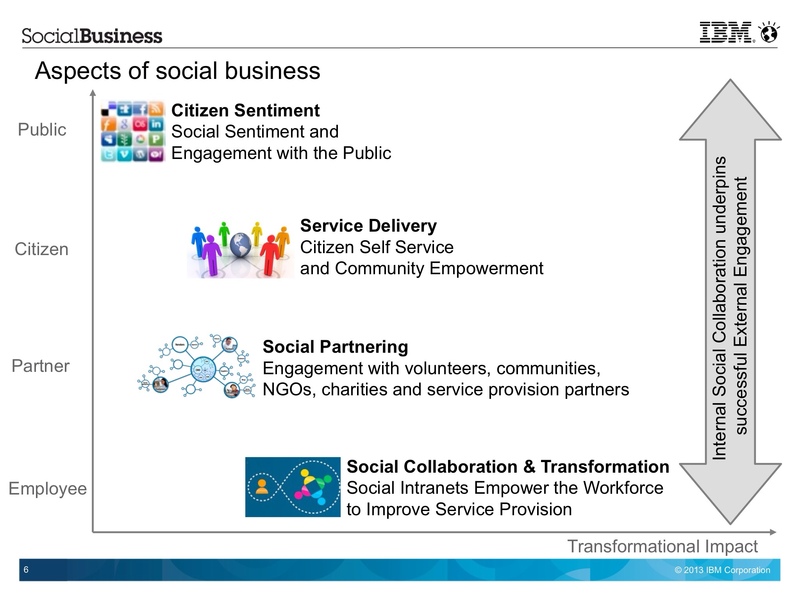 We saw it when Social, Mobile, Analytics and Cloud (which are starting to be labelled SMAC) came together to enable the social business transformation. This is why whole industries seem to move forward in unison when the conditions are right – and at the moment, it is this happen with digital in the public sector. Social Media gives the consumers a voice. Mobile devices enable digital interaction when you are not sitting at a desk. The economic downturn drives a need for governments to invest in delivering services at lower long term costs. Open data creates new ways of using multiple organisations to deliver services. Social collaboration enables employees to work together across silos. A perfect storm driving the digital agenda in government. In Scotland, the devolution debate is providing the impetus for government to use these technologies to deliver a better citizen experience, providing an extra impetus that seems to be driving this transformation faster than in other countries. But around the world we are going to see dramatic steps forward in the near future as social business is applied to the business of government. Tomorrow I'm back in Edinburgh for the Innovations in Public Sector event, and I'm really looking forward to participating in moving this social business agenda forward again. This entry was posted in Uncategorized and tagged business, government, public, sector, social. Bookmark the permalink.